"Words cannon even begin to express the amount of motivation and inspiration you have instilled in us after listening to you speak yesterday. We both went in the hopes that we would walk away with just one little tidbit of information to take back to the box with us, but we were given so much more! We walked away with an arsenal of knowledge to utilize not only in the box, but in our daily lives. Your desire to share the knowledge and wisdom you have gained over the years is contagious, and we cannot wait to get in our box on Monday to start making positive change, and to relay the new tools and skill set we learned from you. Thank you, once again, for your hard work and dedication to this sport." Note: We will score todays “Tabata Session” by counting every repetition. The Handstand Push-up station adds an advanced twist to the standard workout. Even holding the Handstand for 8 rounds of 20 seconds is a great accomplishment, especially at a high heart rate. Athletes can pick their start station, but must honor the order of rotation. Congratulations to Brandon who was recognized as Athlete Of The Week at CrossFit Amundson and Krav Maga Santa Cruz. Brandon has been an extremely dedicated athlete since the moment he walked in the door, and his progress has been awesome to behold. Brandon’s passions are martial arts and Parkour, and as a result, his balance, agility, coordination and speed have been developed to a world class level. Brandon has completed the previous Phase trainings and Weapon Defense trainings at Krav Maga, with resounding success. However, his real talents in martial arts are now being exposed through the rigorous Yellow Belt class that is underway. 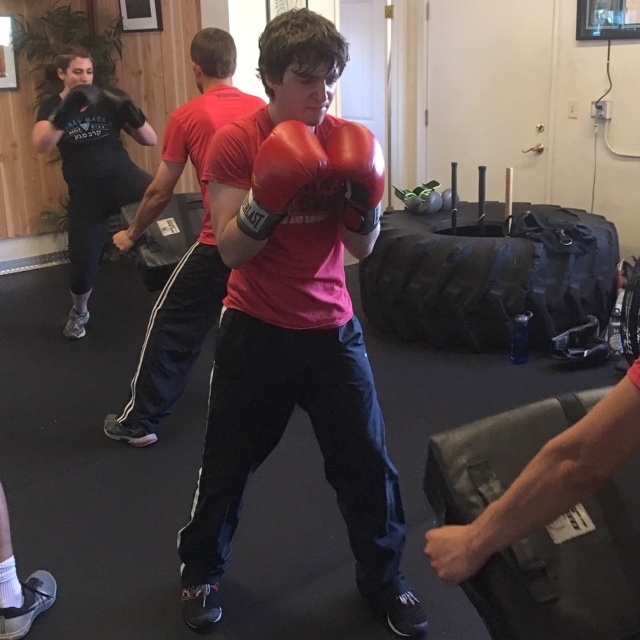 In addition to his physical skill, Brandon exhibits the character traits of the true integrated martial artist and warrior: compassion, kindness, perseverance, determination and laser-focus. Congratulations Brandon on all your success, and keep up the inspiring work! Attention Krav Maga Yellow Belt students: The official Yellow Belt Test has been scheduled for Wednesday, June 14, 2017, from 6PM to approximately 8PM, followed by a Belt Ceremony at 8:30. Family and friends are welcome to attend this monumental night of testing, challenge, and accomplishment. Our Light programming will be our HQ workout today.